When you think of the most obvious places to promote your employer brand, your first thoughts might be of professional networks like LinkedIn, or popular social media platforms like Facebook and Twitter. What many people don’t think of in this context is YouTube—even though it has more than 1 billion users! Not only does it have a billion users, those users watch 1 billion hours of video each day through its website and mobile app. Sure, the platform has its obvious strictures and limitations (it exclusively focuses on video content, which can be costly and time consuming to produce), but if you’re producing videos for your recruitment efforts anyway, YouTube is the obvious place to promote them. So, let’s dive into some tips and tricks for spreading your employer brand on the world’s biggest video-sharing platform. Okay, we’ll admit that this first tip is less about YouTube per se and more about video production, but we think it bears a mention. After all, the videos you post on this site are going to define the way your employer brand is perceived, and as such it’s important to be deliberate about your strategy. So what does a successful recruiting video look like? Crucially, it focuses on human beings—specifically, the human beings that work each day to help your company to grow and thrive. Focus on employee testimonials, employees describing their work, and employees explaining what your company and its mission mean to them. This will help potential future applicants feel like they’re getting a real look into what it would be like working for your company, thereby helping them to overcome one of the most significant hurdles in the candidate’s journey. Let’s say you’ve created the greatest recruitment video ad of all time. The script, acting, cinematography, and editing are all Oscar-quality, and you’ve finally gotten the chance to share it with the world. After a few weeks, you realize that it’s getting tons of views, but your application rates haven’t actually increased. What might the problem be? Possibly, viewers are watching your video and absorbing its message, but they don't know what action to take next. Why? Because there’s no call-to-action in your video. Nowadays, YouTube makes it easy to insert links and CTAs into your videos, so that as users are watching they're presented with discrete actions to take if they’re responding positively to the content. If the aim of your ad is to promote your employer brand more generally, your video might link to your corporate careers page, offer an e-mail newsletter signup, or link to a social media careers page (this could even be your YouTube account) for users to like or subscribe to. If, on the other hand, the video is for a specific job opening, your video should link to a landing page specifically for that job. This way, your candidate will be unlikely to drop out of the application just because they’re not clear on which steps to take next, or because they feel like you’ve made it difficult for them to apply. 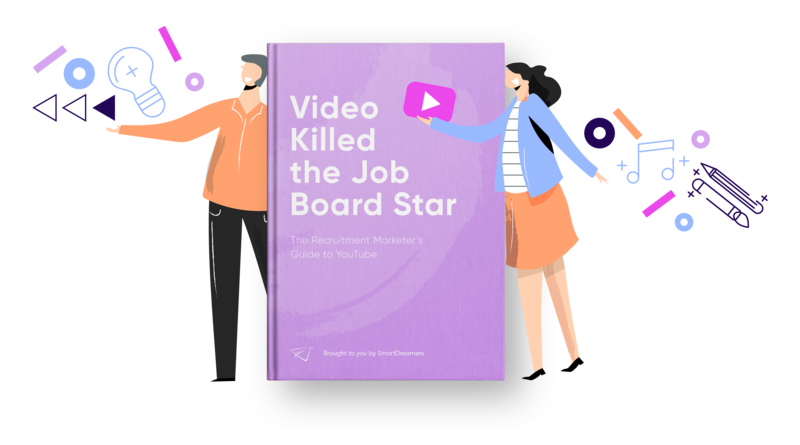 Now, I know what you’re thinking: you’ve put all this work into crafting the perfect recruitment video—shouldn’t truly high-quality content find an audience on its own? Yes and no. Plenty of businesses do their best to create viral recruitment campaigns that bolster their employer brand, and those businesses certainly can see returns, but not everyone’s employer brand will lend itself to the kind of content that spreads like wildfire around the internet. Sometimes, especially when there’s time pressure to fill a specific role, it’s better to give your content a little nudge. This is where YouTube ads comes in. TrueView ads: these ads are notable because you don’t pay for them unless the user watches at least 30 seconds or clicks on a link or call to action. These typically take the form of a “sponsored post” in someone’s search results or suggested videos, or a skippable ad at the beginning of another video. PreRoll ads: these 15-20 second ads are not-skippable, and they play either at the beginning of another video or in the middle of a video that’s 10 minutes in length or longer (“mid-roll”). With these, advertisers pay per click. Bumper ads: Bumper ads are just like PreRolls, but they’re limited to six seconds. For most companies, it would be extremely difficult to convey your employer brand or promote a particular job opening in such a short amount of time, but these can still be useful when they act as a complement to other, more fully fleshed out campaigns. There’s a lot more to be said about these in later blog posts. But for the time being, just remember that these ads can be a good way to make sure your video branding efforts don’t go unnoticed. This tip is, admittedly, just for those who are taking our advice and running some ads. One of the targeting options that YouTube offers is a “remarketing” campaign, in which your ad is shown to users who have already interacted with your content or visited your website. This can be useful for keeping your business top of mind for those in the early stages of the candidate’s journey, and for letting interested job seekers know about newly opened positions. What’s really interesting, however, is that in addition to remarketing campaigns, you can also use “negative remarketing” to show your ads only to those who have never previously interacted with your videos or website. While the former might be helpful for second and third touches within your recruiting funnel, the latter can be a really valuable tool for reaching a new audience with your employer brand and potentially laying the groundwork for future applications. More than that, these options let you further segment your audience when it comes time to actually create the content that’s being disseminated, meaning that you could create videos designed specifically for those who have never encountered your brand before. This last piece of advice should be pretty self explanatory. The average viewer’s attention span is maybe a minute. When it comes to skippable paid videos, there are arguably some disadvantages to being too brief (since you only have to pay for users who watch the whole video, it can be helpful to make it long enough that you’re fairly certain of having truly gotten their attention), but even then you don’t want to go on for too long. This is, of course, a real challenge. Conveying your entire employer brand narrative in half the space of your average movie trailer is no mean feat—but the reward is worth the effort. Potential applicants will appreciate not just your story, but the respect you demonstrate for their time, and they’ll show their appreciation with future engagement. There’s plenty more that can be said on each of these topics, but for now, we’re going to try and follow our advice about keeping things concise!